Once thought to be waste, rice husks now can be used as clean, cheap fuel for developing countries. Alexis Belonio’s obsession with rice husks began in 2003, when rising fuel prices and heavy dependence on foreign oil slammed his native Philippines with an energy crunch. Mr. Belonio was already an accomplished inventor, having designed over 30 devices ranging from paddy dryers to water pumps for poor Filipino farmers. So his thinking led him to the cooking stove, an item fraught with expense and danger in the developing world. More than a third of the world’s population can’t afford propane or other petroleum-based cooking fuels, relying instead on biomass such as wood or charcoal. Most biomass is burned in inefficient stoves that emit soot, smoke, and toxic fumes. Belonio envisioned a safer, cleaner, and less-expensive way to cook. 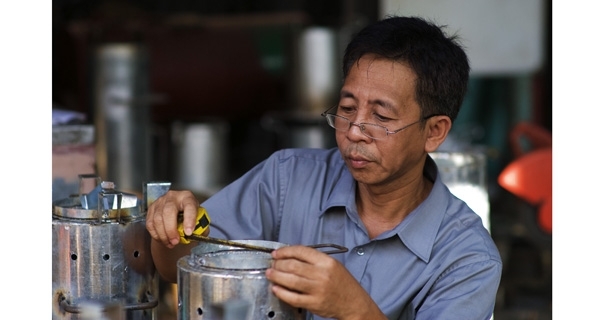 Working largely in isolation and with little funding, he turned rice husks – an inedible byproduct of milling rice for food – into a bright blue flame.